Now in full color and updated with new case studies, the second edition of this straightforward text is designed to help you excel in parasitology. Learn how to confidently perform the clinical procedures needed to collect specimens and obtain diagnostically useful parasitic samples to provide the most accurate results for patients. 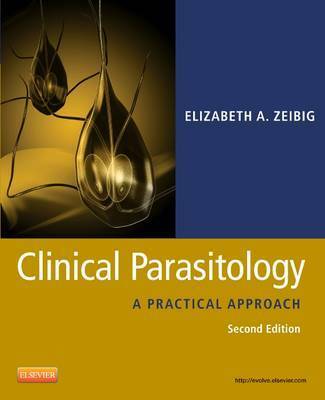 The user-friendly design, extensive illustrations, and clear descriptions of look-alike parasites help you hone your skills and prepare for situations you may encounter in practice. Thorough descriptions of the different forms of parasites within that organism type aid in classification. Characteristics at a Glance tables cover the most medically important parasite forms and include comparison drawings of look alike parasites. Test Your Knowledge! review questions enhance review and retention of chapter content. Numerous detailed drawings, with structures labeled illustrate the information in an easy-to-understand format. Individual parasite descriptions include concise information on life cycles, epidemiology, clinical symptomatology, laboratory diagnosis, treatment, prevention and control, notes of interest, and new trends. Increased number of case studies offers more opportunities for application of chapter content to real-life scenarios. Identification worksheets let you make your own drawings of parasites. NEW! Full-color design throughout the book provides a more accessible look and feel. NEW! Quick Quizzes, or periodic self-assessments, are included in each chapter to assess your knowledge. NEW! Student resources on the Evolve companion website feature additional case studies, interactive quizzes, and a veterinary parasitology reference guide. NEW! Focusing In boxes and Looking Back boxes, offer helpful chapter introductions and chapter summaries respectively.